The risks of climate change are potentially immense. The benefits of taking action are also clear: we can see that economic development, reduced emissions, and creative adaptation go hand in hand. A committed and strong low-carbon transition could trigger a new wave of economic and technological transformation and investment. 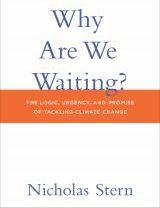 In his new book, ‘Why are we waiting?’, MIT Press (forthcoming), Nicholas Stern explains why, notwithstanding the great attractions of a new path, it has been so difficult to tackle climate change effectively. Stern argues that the risks and costs of climate change are worse than estimated in the landmark Stern Review in 2006 and far worse than implied by standard economic models. He reminds us that we have a choice. We can rely on past technologies, methods, and institutions or we can embrace change, innovation, and international collaboration. The first might bring us some short-term growth but would lead eventually to chaos, conflict, and destruction. The second could bring about better lives for all and growth that is sustainable over the long term, and help win the battle against worldwide poverty. The science warns of the dangers of neglect; the economics and technology show what we can do and the great benefits that will follow; an examination of the ethics points strongly to a moral imperative for action. Lord Stern is I. G. Patel Professor of Economics and Government at the London School of Economics, President of the British Academy, Chair of the Grantham Research Institute on Climate Change, and former Chief Economist at the World Bank. He was the lead author of the influential Stern Review on the Economics of Climate Change. Lord Stern will be in Vienna to accept the Schumpeter Prize, awarded annually by Austria's Schumpeter Society to eminent economists, business people or politicians.